Just like Biryani, this is another royal Indian dish, believed to be introduced in India by the Mughals. In Persian, the word “Rogan Josh” means something which is boiling, hot and red in colour. Rogan Josh is a signature dish in Kashmiri (Wazwani) cuisine and probably, one of the finest meat dishes in India. Kashmir takes its cuisine very seriously. In fact, I have heard many Kashmiris saying that they regard cooking as a form of art and it is almost like their second religion. The authentic Kashmiri cooks (called wazas) have perfected signature Kashmiri dishes, such as Rogan Josh, with their skills and experience. For them, Rogan Josh is not just a dish, but an extension of their culinary skills in its epitome! · The oil to be used in making an authentic Rogan Josh is mustard oil. You can replace mustard oil with a mixture of plain oil and ghee if mustard oil is not available. 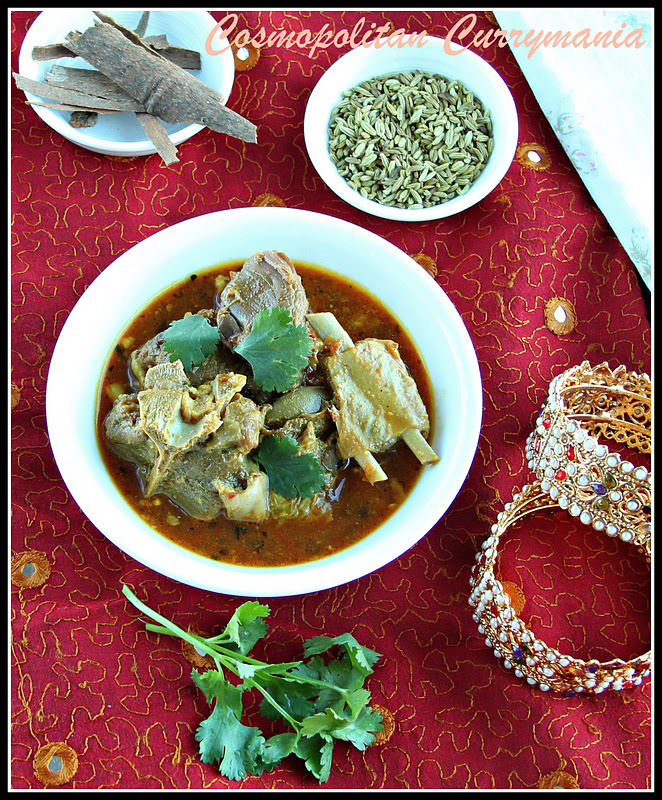 · Use the freshest and best-quality mutton (meat of a male goat) for this dish. The shank or the shoulder of a male goat have the most succulent meat and are preferred highly in many Indian mutton preparations. The size of the meat pieces should be medium (chopped roughly into two-inch-sized pieces), so that the flavours percolate down the meat very well. Mutton can be replaced with lamb meat. Please note that the meat is never marinated in the traditional Rogan Josh preparation. · Tomatoes should not be used to prepare Rogan Josh. The rich red colour is from the addition of an indispensable ingredient in this authentic Wazwani (Kashmiri) dish: Kashmiri red chilli powder, which imparts a gorgeous red colour and is mildly hot compared to other red chilli powder varieties. To reduce the hotness even further and still get the same, rich colour in your Rogan Josh, you can mix equal quantities of Kashmiri red chilli powder and paprika. · The Hindus of Kashmir do not use any onion or garlic in this dish, but use yogurt or curd, fennel powder and asafoetida to impart richness. For the same curry, the Kashmiri Muslims, however, use onions and a special ingredient called maval/mawal, described next. · An ingredient called rattan jyot/ratan jot ormaval/mawal, which is actually dried cockscomb flower, is traditionally added to the dish (for its deep red colour) at the end by boiling it with equal quantity of water. In addition, saffron dissolved in a little milk is added to give it a subtle enrichment in its flavour. But don’t worry if you don’t get these ingredients: your Rogan Josh will still taste very good without them. Just like Mexican and Korean cuisines, Indian cuisine also involves extensive use of chillies. Interestingly, some kinds of chillies are not hot, but just add flavor and colour to a particular dish. Indian cooking makes use of chillies in varied ways to impart distinct tastes and colours. There are a number of dry red chilli (sookhi laal/lal mirch) varieties used in Indian cooking, the prominent ones being the Kashmiri red chillies, the ‘fake’ Kashmiri red chillies (called dubby), single reshampatti, double reshampatti, yellowish red chillies, byadgi, Goan small and pointed red chillies, Guntur red chillies and Nellore red chillies. The good news is that, rogan josh demands the use of Kashmiri red chilli powder, which is just mildly hot! A traditional Wazwani dinner at a Kashmiri household or restaurant involves cleaning the hands with warm water (in a traditional vessel) before anything else. The delicacies include popular names, such as tabak maaz, rogan josh and rista, along with an assortment of kebabs and vegetable preparations. Finally, another unparalleled meat dish called gushtaba is served, before moving on to the dessert. Phirni is the common dessert cooked here, with rice and milk as the main ingredients. Last but not the least, the Wazwan is never complete without a cup of warm kahwah tea! In Kashmiri cuisine, the use of curd or unsweetened yogurt (dahi) is very common, as are asafoetida (hing), aniseed (saunf), Kashmiri red chillies, saffron, dry fruits, nuts and dry ginger (saunth). Note: This recipe is an amalgamation of Hindu and Muslim ways of cooking traditional Rogan Josh. That is why, both onion and curd are used together. Also, exotic ingredients, such as ratan jot, have been replaced to make it compliant with the global palate. 1. Boil the mutton (along with the bones) with the garlic, half the salt and water, until the mutton is half done. Remove from heat and strain the stock. Keep the boiled meat aside. 2. Whisk the curd properly with 3 tbsp water and set aside. 3. Mix the saffron with warm milk and keep aside. 4. Fry the shallots in oil, until they are just light brown. Add cloves, bay leaf, cinnamon, cardamoms and the mace and fry for 1 min. 5. Add the coriander, ginger, fennel and turmeric powders dissolved in a little (around 5 tbsp) of the reserved mutton broth. Lower the heat and add the curd to this and stir continuously to avoid the curd getting lumpy (that is why, while whisking, water is always added to the curd). 6. After 5 min, add the boiled meat. Sauté for about 15 min, until the liquid almost evaporates and the sauce coats the mutton well. Add the remaining salt, garam masala powder and the mutton stock and stir thoroughly. 7. Add the chilli powder, cover and boil for 15 more minutes, or till the mutton is soft, yet chewy and the gravy looks thick and creamy. Add the saffron-milk mixture and cook for 5 more minutes, stirring well. 8. Garnish with freshly chopped coriander leaves and serve with pilau, steamed rice, roti or naan. Excellent recipe: very scholarly! Thank you. I’m going to try it this afternoon.